After much thought, I have moved changed my website name and moved my entire site over to RealFoodRN.com. I will continue to produce the same content and cover the same topics. I just have a new look. Please stop over and check it out. Leave any feedback about what you think of the new site. Please! Please sign up for my email newsletter HERE if you would like to continue getting updates and information from me. Don’t worry, I won’t SPAM you! So the bio-hacking nerd in me is totally crushing on Dave Asprey’s amazing brain and all the info he puts out. 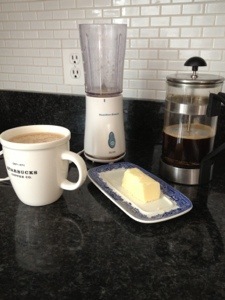 Enter: Bulletproof Coffee. The man’s a genius. I had been hearing about how tasty butter and coconut oil are in your morning cup of Jo but oh wow…..it’s, it’s breathtaking! 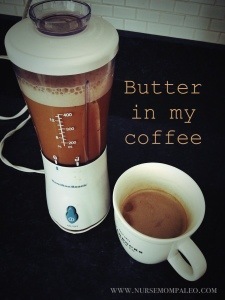 Brew up your coffee and pour into a blender, add as much butter or coconut oil as you like. I put in quite a bit. Blend until smooth, this gives it the great mouth-feel. Yeah, it’s good. To add some sweetness to it, throw in some chocolate flavored Stevia. 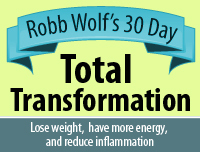 I would have added it today, but I’m doing the 21 Day Sugar Detox (see sidebar). Next week, Stevia it is! Take that Starbucks! Pour into glass container to store. Apply to your skin. Use daily for best results. Note: when applied you might notice that it can be itchy. I have found that my lower back tolerates it best, with the least amount of itching. 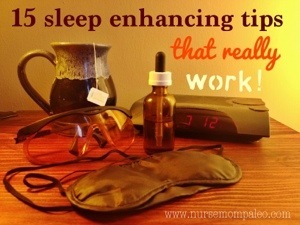 15 Sleep Enhancing Tips That Really Work! After having children, I discovered how much I love sleep….because I was not getting any! Oh wonderful, beautiful, elusive sleep. In my on-going exploration of health and nutrition I decided to investigate sleep optimization, and here is I found to work the best for me and my family. First, if you are having trouble sleeping, you should try to get to the source of your insomnia and eliminate that source if possible. 1) Cut out caffeine (caffeine can stay in our systems for anywhere from 5-15 hours!). If you can’t cut it out completely, then go half-caff and have your last cup no later than noon. Caffeine is in chocolate too, sorry to burst your bubble. 2) Eat the majority of your harder to digest protein earlier in the day. Meat is harder for your body to digest (especially if you don’t chew it well enough) and if you eat a large meal that focuses heavily on meat later in the evening, your body will be focusing on digestion all night instead of restful sleep and detoxification. Gelatin is a great source of easy to digest protein. Stir some gelatin into your tea or have a cup of bone broth. Gelatin also helps with sleep. 3) Buy a bed that is right for you. For example: a sleep number bed. My husband likes firm and I prefer soft. A good bed is a great investment! Wear earplugs if you need to or turn on some white noise like a fan or a noise machine. There are tons of white noise apps out there to! 5) Install F.lux on your electronic devices so you aren’t exposed to blue light emissions in the evening hours (this also decreases melatonin production). F.lux is free so what are you waiting for? 6) Turn your lights down in the evening hours as the sun goes down, or use candle light. This naturally stimulates melatonin production and starts our sleep-cycle. On the flip-side you will also want to make sure you have exposure to the wide-spectrum light (natural day light) during the day. This boosts serotonin levels, which increases melatonin production later in the day for restful sleep. Bright light is especially important to get earlier in the day so get outside in the morning! 7) Go to bed when you start to feel tired, or before. Don’t force yourself to stay up and watch all of your favorite recorded TV shows so you can “relax” at the end of your busy day. If you feel tired then go to bed. You will be much happier you chose to forgo TV and get some extra (much needed!!!) sleep. 8) Avoid alcohol before bedtime. It increases wakefulness and decreases sleep quality. 9) Avoid sugar before bedtime. This can cause blood sugar fluctuations that can wake you up in the middle of the night. Blood sugar drops, cortisol spikes and you wake up. 10) Invest in some orange safety glasses. These also block blue light emissions. I wear mine every night, whether my husband likes it or not! 12) Go to sleep at the same time every night and wake up at the same time every morning. Yes even on the weekends. This allows your body to get into a sort of sleep routine. Plus, on the weekends you can really get a lot done around the house in the morning. I sure do! 13) Make sure you are getting enough magnesium. Magnesium has a calming effect on the nervous system and allows you achieve a deeper level of sleep. It also decreases cortisol production. Every noise waking you up at night? You might be low in magnesium. Do you get leg cramps at night? You might be low in magnesium. You can supplement orally with supplements like Natural Calm or make your own magnesium oil to apply topically. 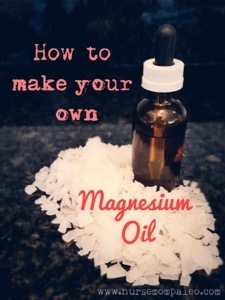 I use my homemade magnesium oil every night. You can also take a bath with epsom salts. 14) Stop drinking water 2 hours before bedtime (the exception being your sleepy time tea). This way you wont be getting up to go pee right after you fall asleep. 15) De-stress! How do you expect to fall asleep when your mind is running a million miles an hour and you are rigid with tension? Practice meditation, get a massage, get regular exercise, do yoga, or practice deep breathing. What tips and tricks do you use to fall asleep? Let me know in the comments below. I would love to give them a try! 30 Healthy Living eBooks, only $39! Wouldn’t it be nice if someone just sorted through all of the information out there related to health and wellness and put it into one place? A place where you could learn to cook real food, heal your metabolism, nourish your kids, clean your home naturally, stock your pantry, and make healthy desserts? Well, you can!!! This week all of your burning questions will be answered with the Spring eBook Bundle from Village Green Network! The best part is that after you purchase the eBook bundle, all 30 of the healthy living ebooks are YOURS TO KEEP! You can download the entire package and keep them to read whenever you have time. The great thing about eBooks is that you will be able to download them and get reading right away! You will not have to wait to get them in the mail, or have to go pick them up at the library. They will be emailed right to your email inbox! But they will only be this cheap for one week, then the price goes back up. So take advantage of this amazing offer right NOW. 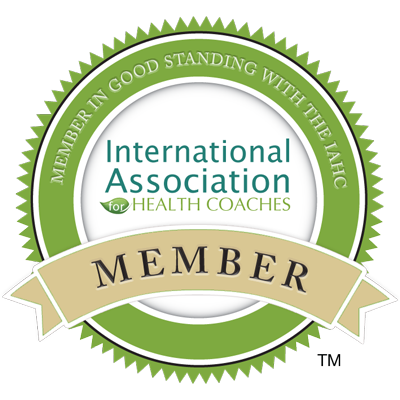 It has taken me years to read through all of the blog posts and books on health and nutrition that I have read. I wish this eBook bundle had been around when I started out….would have saved me a ton of time! Not to mention a ton of cash because right now you can get all of these life-changing eBooks for less than $1.50 each! Click here to see the full list of all 30 eBooks in the bundle. Order the bundle and you’ll get instant access all 30 eBooks to download and read on your computer, laptop, smartphone, tablet or electronic reader. Save over 90% for 7 Days Only! It would cost you $479 to go buy each of these books separately, but for 7 days only you can get all 30 eBooks for only $39–that’s over 90% off! Don’t miss out on this incredible deal! The Spring eBook Bundle is only available until April 23, 2013. After that, this offer will be gone. That means if you don’t buy the bundle this week, you will have to buy each book at its regular price if should decide to read it. Click here to order all 30 eBooks for $39 and save over 90% now. Now is your chance to take advantage of incredible savings! This week only — get 30 eBooks for only $39! That’s less than $1.50 per eBook — a savings of over 90%! Think about it, you probably spend more on latte’s each week! For the price of a cheap pair of shoes, you can get 30 amazingly informative eBooks from some of the greatest online resources of health and nutrition. Download all 30 eBooks now for this LOW price and read them at your leisure — on your Kindle, iPad, iPhone or computer. — only $39 (A $479 value!). Click here to order the Spring eBook Bundle today! After you order the bundle I would love to know which book you found to be the most useful to you! Leave your comments below. So, my husband made dinner. I’m still in shock. In a skillet heat coconut oil, butter, and garlic on medium high heat until fragrant. Add shrimp. Cook until pink on one side, then flip. About 3 minutes per side. 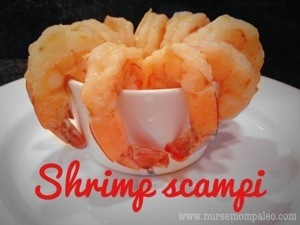 Serve with melted butter. My kids are usually very good eaters when it comes to getting their fruits and vegetables, but occasionally they will boycott and go on a mono-diet of hidden-liver meatballs or Mickey Mouse pancakes. In those instances I make up a big batch of juice. On the days when they resist even drinking fruit and veggie juice I pull out my bag of tricks. Take them shopping and let them pick out the fruits and vegetables. 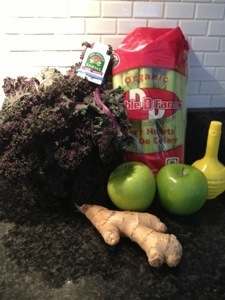 We used purple kale today because that is the current favorite color. Make it into a tea party and use fun glasses and tea pots. I can get my kids to drink an entire batch this way…even my son likes tea parties! When all else fails you drink it and tell them that they can’t have any….reverse psychology will have them begging for it! Core the apples. Cut the spine off of the kale. Cut the white part off the celery. Blend all ingredients until liquefied. Pour the blended mixture through the finest strainer you have, over a bowl to catch the juice. Do what you want with the pulp, I use it to make frozen baby food. Now put it into fun glasses and enjoy. The batch we made this morning lasted about 4.3 minutes, after they fought me about eating some fruit with their breakfast. Sneaky, sneaky. P.S. This is superior to buying the V8 junk from the store, because about 30 minutes after you juice fruits and vegetables their nutritional value starts to diminish. Think about how long those V8 bottles have been on the shelves. Plus, many brands add high-fructose corn syrup to add that hyper-palatable sweet flavor. Avocados are a staple food in our household and we go through a lot of them every week. I sent my husband to the grocery store a few days ago and on the list it read “avocados, buy a bunch of them”…I should have been WAY more specific because he came home with a dozen avocados. 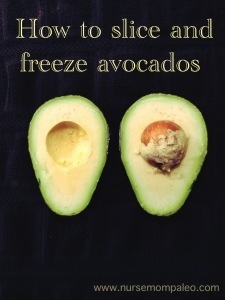 Well, even the most avid avocado-eatin’ people can’t go through a dozen ripe avocados before some of them go bad. So, I had to do something with them. Then I found out that you can freeze them. Wow! Freeze them I did! They stay perfect and they last! 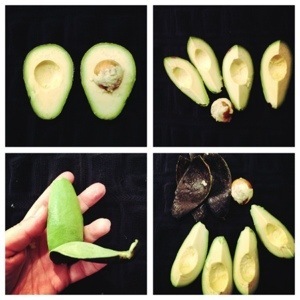 Slice an avocado into quarters and take out the pit. Peel off the outer layer. (Here’s a short video showing the same slicing technique that I use.) 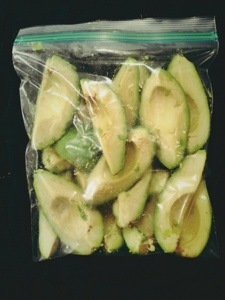 Stack into a plastic freezer bag and into the freezer they go. It’s just that easy. They work great for smoothies with frozen banana’s because they have a great ice-cream like texture when blended. Single-serving slices right out of the freezer. This bag of frozen slices had been in the freezer for 2 weeks and they are still bright green! My little cave-family eats more like a pack of saber-toothed tigers. They eat a LOT! I pride myself on my meal planning (and quantity planning) abilities, but sometimes I fall short. When my fridge is bare I fear I will be eaten next. 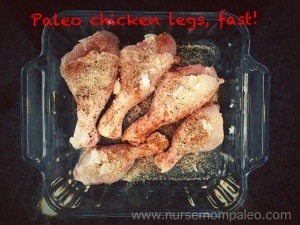 So, I always have a package of organic chicken legs in the freezer….it just might save my life someday. Pre-heat oven to 375*. Grease a glass baking dish with coconut oil. Placed legs in dish and pat dry with paper towels. Smear with coconut oil. Season liberally with spices, they add a nice texture and crust. Bake until a meat thermometer reads 165*. You can baste with the juices as it cook,s but that’s totally optional. Who has time for that while fighting the family off with a wooden spoon anyway?! I ate a limited amount of red meat during a weird phase in my 20’s. Then one day I started to crave red meat and decided to reincorporate it back into my diet. For me, cooking a steak was definitely the most intimidating way to prepare red meat. Growing up in Minnesota, I was VERY familiar with cooking ground meat because we are like the hotdish capital of the universe! After much trial and error I have come up with a method that is very easy, not intimidating at all, and super tasty. Move over hotdish, Mama’s making steak tonight. If you don’t have access to quality grass-fed meat you can order from US Wellness Meats, we order from them frequently and everything we have ordered has been amazing! 1 good quality grass-fed steak. About one hour before you plan to cook your steak, take it out of the fridge and put it on a plate. Cover it with coarse sea salt and rub it in. Do this on both sides. The salt will dissolve. Hold your steak with tongs and find the fatty side of the steak. Push the fatty side of the steak down on the pan until some of the fat melts and greases the pan. 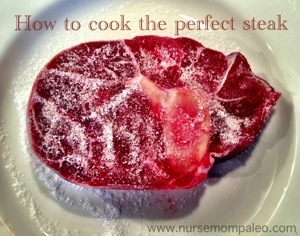 Then put your steak in the pan, season with salt and pepper, and let it cook. Once it browns, flip it. Cook and season the other side. Remember not to over-cook your steak. The meat will continue to cook even when you remove it from the heat source. Use the finger test to check if it’s done to your liking. You can also use your meat thermometer. I like to melt a little bit of butter on the top of my steak after its cooked. Let it melt and dig in. DISCLAIMER: I am a Nurse, not a doctor. The information on this blog is not intended to be taken as medical advice. My posts are meant to be a source of informative content about nutrition and health. I hope you find this blog helpful as a learning tool and a thought-provoking information source. It should be noted that I do get paid a small commission for some of the products I talk about and link to from my blog. Your support keeps this blog running and is greatly appreciated. I'm just another mom-blogger who is trying to save the world. I work in the medical field and see how much our health can be devastated by what we put into our mouths! 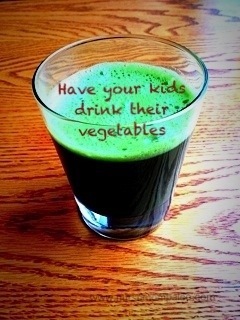 My mission is to optimize nutrition for my growing babies and my whole family. 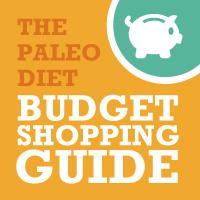 Paleo is helping me to accomplish my mission.